Every business needs to make money. When offering many products or services to many customers with different revenue mix at different prices and cost it can be difficult to know exactly how profitable each individual customer is. We are using tools that specialize on analyzing, visualizing and improving customer and product profitability. 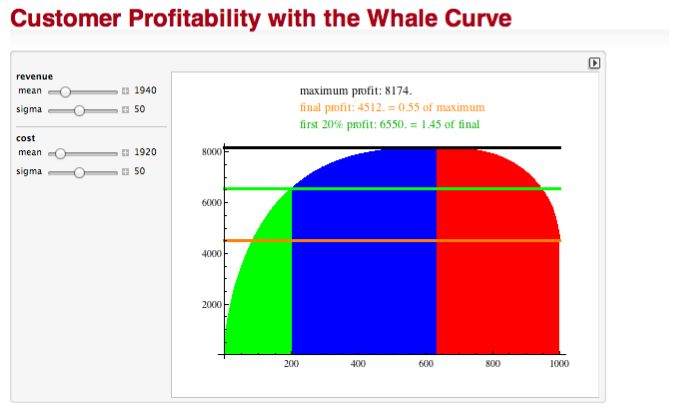 The underlying concepts are often simple enough to quickly grasp – such as the whale curve profitability chart. You may be surprised how much insight you can get about your own business by visualizing your relevant business data in the right way. The right tools and our experience make this a quick and inexpensive proposition for you. Here is a short 5 min video illustrating the concept of a Whale Curve to analyze customer and/or product profitability.